Alpina is a renown marque in the automotive world. With 45-years of experience Alpina adds – and lets quote – ‘sensation to sports cars that already drive like a dream’. The latest member to the family is this coupé, called the Alpina B3S BiTurbo. And we had to find out what it is capable of! Based on the standard and current BMW 3 Series, Alpina is offering a package available for Sedan, Coupe, Estate and Convertible. The main subject regarding the kit is based on improving the car’s performances, positioning itself between BMW’s 335i and M3. Additionally, the Germans offer exterior and interior enhancements giving the sports car distinct looks not losing the true BMW presence and giving him enough skills to attack its close relative, the BMW M3 E92. The B3S BiTurbo debuted at this year’s Geneva Motor Show, back in March, following similar releases in the past few years. The BMW specialist from Buchloe – close to the home ground of Munich – decided to use the 3.0 liter petrol engine available in the current BMW 3 Series line-up as the main donor for the project. The tuned engine was outfitted within our Coupé test car and the main point of focus during the road test. The power coming from the 3.0 liter straight-six aluminum block with Bi-Turbo charging which delivers 400bhp enough – in Coupe and Saloon form – to give it a 0-100km/h (62mph) time of 4.7 seconds. The touring will need 0.1 second more to hit the 100km/h barrier and the convertible 0.2 seconds. Top speeds are set at 300km/h (188mph) for the first duo, 296 km/h (185mph) for the touring and 298km/h (186mph) for the convertible with the roof closed. The B3S Bi-Turbo pairs increased performance and torque with fuel consumption and reduce CO2 emissions. The B3S’s engine produces 400hp at 6,000rpm and a maximum torque of 540Nm at 4,500rpm. The sporting engine revs up to 7,000rpm, yet offers a smooth and strong thrust across a wide range – 400Nm of torque is already available from just 1,300rpm, all the way up to the maximum of 6,000. The six-in-line power plant is outfitted with a second generation direct injection combined with Bi-turbo charging. The air intake and air filter system have been optimized in terms of pressure loss and the exhaust system optimized in terms of back pressure. In combination with Mahle pistons, a maximum boost of 1.2 bar with a compression ratio of 9.4:1 can be achieved. The 400bhp and 540Nm is converted to the rear wheels trough the Sport automatic ZF 6HP19 Switch Tronic gearbox. If requested you can also get the four-wheel drive transmission. The Alpina Switch Tronic box offers two-sided control; Automatic modes offer easy shifts and relaxing drives, while the manual mode opens the sporty character of the gearbox. On the back of the wheel two simple shift buttons are available for up- and down-shifts. Personally we would prefer pedal shifters instead of these buttons, which lack a true ergonomically control of the gears normally experienced with pedal shifters. Regarding the looks we can be precise and short. 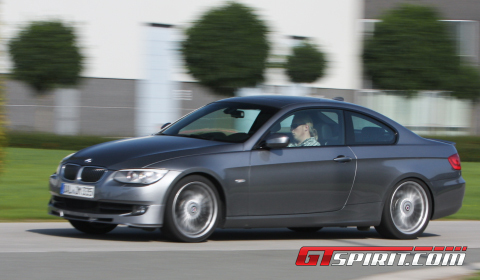 The setup resembles the BMW 3 Series Coupé, but includes some additional upgrades giving it an Alpina touch. The front spoiler reduces lift at the front and enables optimal air flow to the cooling system. The Coupé and Convertible carry a new rear valance which includes the rear diffuser and two distinctive double-ended exhaust pipes. The wheel / tire set-up with 245/40 ZR18 front and 265/40 ZR18 rear complements the exterior looks of the turbocharged 3 Series. Our test vehicle was outfitted with Alpina Classic light-alloy wheels, where each of the twenty spokes leads from the hub right to the edge of the rim. 19 inch rims are available upon request. You will get a standard set of features like adapted suspension, cruise control with automatic brake function, bi-xenon fog lights, tire pressure indicator and several safety extra. On the inside Alpina logos reveal the distinct upgrade. 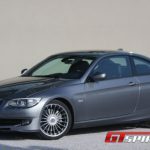 Additionally, a leather sports steering wheel, Alpina leather sports seats, a set of Alpina board watches, floor mats and door sills are added as well. The basis of the Alpina B3s BiTurbo is BMW’s 3 Series platform, a similar setup used by its main competitor the BMW M3 E92. The main differences felt immediately after you hit the street are the lighter alloys and improved body control due to the absence of run flats. Same goes for the power increase bringing the 3 Series pretty close to the performance of the E92 M3 and distancing itself from the stock 335i. The exhaust and air intake upgrades let the engine breath more freely, giving it a better tune from the back where only two of the four tail pipes are used. 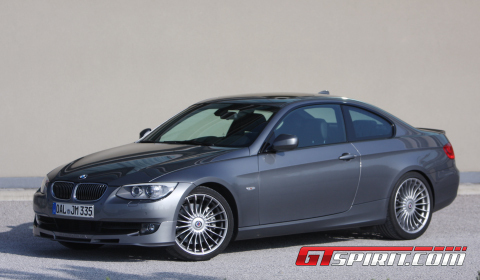 The handling resembles the 335i setup and gives a decent value to the saying ‘Freude am Fahren’. While driving a bit more sportive you will notice that the feeling between the driver and the car is excellent. A small attention should be made to the steering at lower speeds, it could have been a bit lighter. Alpina’s statement that the B3S Biturbo is comparable to BMW’s current V8-powered M3 is a definite go for us, if only it would have had an option of a manual. In any case you could give it the name tag the ultimate road-going 3 Series, but in the end it is mostly comparable to its master and not resembling its complete character. Its own character is different somehow, a master of deception combined with a wonderful 3.0 liter twin-turbo engine propelling the vehicle beyond any available stock 3 Series.